These on-line versions of the registers contain extracts of known items that are preserved in Museums or private collections. Many Chubb locks are still in daily use and for security reasons are only included with the express permission of the owner. The registers show known basic details plus any additional information uncovered by research as well as annotations. With serial numbers running into the millions its not practical to list here every item. We are happy though to consider including items that are still in existence, therefore do tell us about yours. In any event we are happy to look up our records and provide more information such as date etc. about your specific lock, so do get in touch. You can use the links at the foot of every page, or see our Contact Us page for more information, we would be pleased to hear from you. We are also compiling the on-line registers of Chubb subsidiaries or companies acquired by Chubb such as Milner, Chatwood-Milner and Hobbs, so do also enquire about these brands. 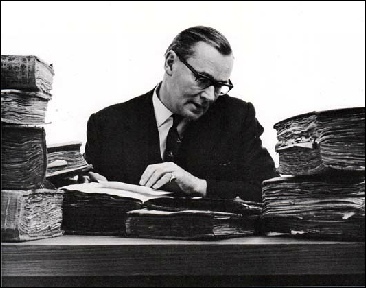 Noel Currer-Briggs MA looking through some of the many volumes known as the Chubb Collectanea from which he compiled and anecdotes for Chubb a book entitled ‘Contemporary Observations on Security from the Chubb Collectanea 1818-1968’ celebrating their 150th anniversary.